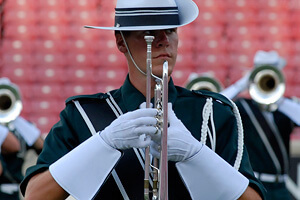 Seven World Class corps went head-to-head during Drum Corps International's opening Premier Event of the 2010 season, Tuesday, June 22 in Louisville, Ky. This was the first competitive performance of the season for the Madison Scouts, who debuted a brand new look that is a throwback to the corps' uniforms of the 1970s. Competitively, the Bluecoats took top honors at the end of the night, surpassing the Cavaliers and Phantom Regiment in their first matchup of the 2010 season. View photos from this event. Read more about the DCI Louisville event.